Amber is an illustrator and cut-paper artist with a love for building books. She loves all things collage, finding new ways to use paper, and sharing her skills. It was such a fun, fab evening, haven't laughed that much in a long time!! Brilliant and very happy with my book! Thank you. An enjoyable and creative way to spend a Sunday morning, Amber has a great way of teaching and explaining all the steps to making these lovely little books, such a fun craft. Has inspired me to make more as gifts. Lots of fun and I learnt a lot! Excellent workshop. Really good fun, informative, and relaxed. Amber was lovely and patient, explained everything really well, and was very enthusiastic which was great! Amber was very enthusiastic and patient with everyone in the class, she did a great job. The class was a little larger than I had anticipated so more space might have been more preferable. The Workshop was fantastic. Amber explained things brilliantly, her papers were gorgeous and we all left with a very professional looking book. Amber's workshop was amazing! She took time to explain all the steps and helped us whenever we needed assistance. Also, she brought a lovely choice of pretty paper for us to choose from and work with and we all got to take a nice notebook and the instructions home - I really enjoyed this workshop! The morning flew by in a flurry of concentration and picking colourful papers to decorate my book. Snow was falling outside and it was such a great class. The size of the group really helped. Personally I find smaller groups much more effective for learning. Really pleased with my notebook. Such a fun and well organised evening, I really enjoyed it and would thoroughly recommend it! Amber is an excellent tutor with so much patience and energy, appearing at a shoulder at just the right time with gentle and diplomatic advice! Definitely 5*. Thank you! It was a really enjoyable and relaxed workshop. Amber was amazing, very kind and friendly. She explained in details what we had to do and didn't mind repeating herself more than once for those who were a bit slower in crafting. We even went a bit overtime but Amber was kind enough to keep going until everybody had finished. 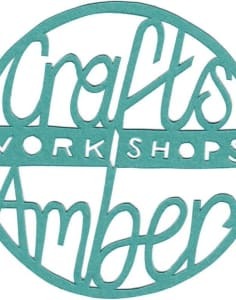 I would definitely recommend both the workshop and Amber. Highly recommended. Amber is patient and amiable, adapting to each individual's speed. I bought this course for my boyfriend for a Christmas and we both absolutely loved it. The class was taught really well. Perfect pace and easily understandable for all levels. Drink, Shop, Do is a fantastic venue too. Really bright and quirky. The cake was delicious! I would highly recommend this course, or others at the venue. Perfect for friends, couples or even hen parties or baby showers etc. I had a great time catching up with a friend over the delicious Drink, Shop, Do cake whilst making these really pretty notebooks. It was a lot of fun and rewarding too. An easy to follow workshop with impressive results! You'll love the cute little notebooks you create! Fantastic morning with Amber's well organised and enthusiastic tuition! Very proud of my little book and would definitely recommend this - gorgeous Drink Shop Do coffee and cake was an absolutely delightful extra treat. Fun and relatively easy to produce a credible little notebook at the end of just a couple of hours. DSD workshop space is a, great location for this and they provided great cake & coffee as we worked away....who could ask for more? I really loved this workshop. Amber the teacher was great. She was attentive and the explanations were clear and easy. The venue was beautiful and the tea and cakes were delicious. Also the number of participants was perfect, there was enough space and materials for everyone to enjoy this very interesting and useful workshop. Will definitely join in the future! Amber was great at teaching! Had such a lovely time with Amber. The class was comprehensive, and quite a nice activity to do for everyone. Great way to spend a Sunday morning- crafting, cake, chat and coffee!Great teacher, very patient and encouraging- I am inspired and confident to make more. We had a fab time and we're very pleased with the beautiful notebooks we made. I definitely feel that I could use what I learnt to make my own notebook. Amber was a great teacher, she was so patient and was happy to explain every detail to each person individually. Love the bonus tea & cake too! We had a lovely time - Amber was really nice and explained everything really well . Enjoyed the cake and coffee as well which was a nice touch Only issue was that the class was reduced after I paid full price (I assume it was because it was low on numbers) which I was a bit frustrated by.Thank you!! This is a great beginners workshop and Amber was very patient and gave us lots of useful tips and information. Can't wait to try more of Amber's workshops! Fab and informative class, really lovely materials to pick from and timing of the course was spot on. Amber is such an excellent teacher and showed us the whole process step by step with lots of handy tips and tricks to make it as easy as possible. The finished notebook looked like something you’d buy in a shop and I can’t wait to make more as gifts for some friends! Amber’s workshop was absolutely brilliant - she was very knowledgable and methodical and the tools and additional tips she gave (for example what all the different book binding tips were called) were top notch. Highly recommend! Bookbinding for Beginners was brilliant! The whole thing from start to finish was very well planned and executed - with excellent instructions and assistance from Amber! I very much recommend this class! Such an easy and enjoyable experience! Amber was open to questions and provided excellent instructions and assistance - this workshop is highly recommended! Amber was a great tutor and made sure everyone had what they needed and explained everything well. She provided a great range of materials and the patterns were popular with the group!The room at Drink Shop Do was a bit small for the group size. It would be better if the workshop size was reduced by 3-4 people, as with materials, instructions, cake and tea the tables were very squashed and it was hard to work as we’d like.Sometimes it was hard for Amber to help so many people at once. If the group size was reduced in the space then Amber could deliver a better session. The teacher was wonderful, I am very pleased with the result. Great cake and coffee too! Amber was lively and upbeat which created a good relaxed atmosphere in the class. She was very attentive and made sure everyone understood the instructions and helped people with any problems. 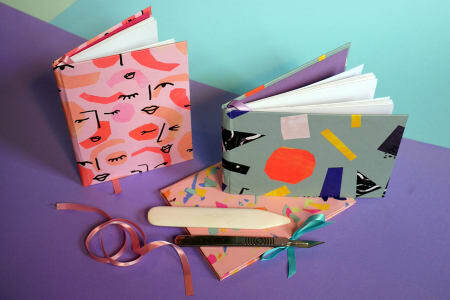 Bookbinding for Beginners at Drink Shop & Do!